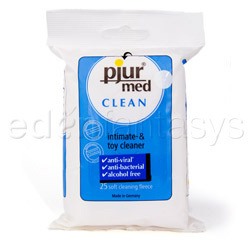 These are a great way to wipe down your favorite toys, especially those that aren't waterproof. They're also great for people with sensitive skin like me. Work great. Don't dry out. Compatible with all materials. Only 25 in a pack. I still thing these are great, but have started using the Pjur spray more because I think it's more green. I save the wipes for travel now - they're especially handy because of the limits on liquid in your carry on if you fly a lot. I've heard some good things about these. Do they have any sort of smell to them? There's a very faint smell that doesn't linger at all. My gut reaction was "no" but there's a little something if you inhale one of them! Thanks for the review! These look like what I have been looking for. I have sensitive skin and these sound great. Thanks so much!